VATICAN CITY (CNS) — Although Pope Francis has not hesitated to break with convention during his brief pontificate, in appointing a seasoned member of the diplomatic corps as the top Vatican official, he resumed a long-standing tradition. The pope appointed Archbishop Pietro Parolin, 58, a longtime official in the Vatican secretariat of state and nuncio to Venezuela since 2009, to be his secretary of state. 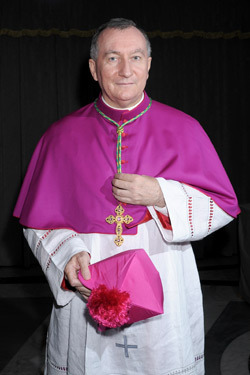 On Oct. 15, Archbishop Parolin will succeed Cardinal Tarcisio Bertone, 78, who came to the post in 2006 after serving as archbishop of Genoa, Italy. The secretary of state is the pope’s highest-ranking collaborator, coordinating the work of the entire Roman Curia, overseeing the operation of the Vatican press office and newspaper, coordinating the preparation and publication of papal documents, and supervising the work of Vatican nuncios, in their relations with Catholic communities in individual countries and with national governments. For years, Archbishop Parolin led Vatican delegations to Vietnam each year to discuss church-state issues with the country’s communist government, a process that eventually led Vietnam to accept a nonresident papal representative to the country. The move was widely seen as a step toward establishing full diplomatic relations. 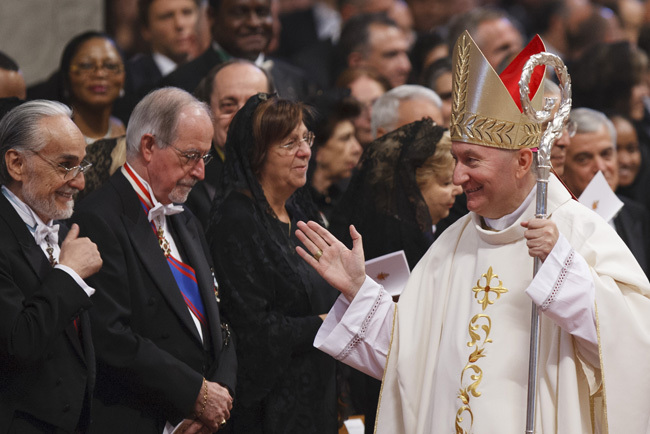 While at the Vatican, Archbishop Parolin also represented the Vatican at a variety of international conferences on climate change, on human trafficking and on the Israeli-Palestinian conflict. He led the Vatican delegation to the 2007 Middle East peace conference in Annapolis, Md. At a news conference in 2006, Archbishop Parolin said Vatican nuncios and papal representatives play an important role “in defending the human being” and in strengthening local churches, especially in regions where Christians face poverty, discrimination or other hardships. The Vatican’s presence around the world through its nuncios shows people that the church and the pope are always near, that Christians — no matter how small their numbers — are not alone in the world, he said. In the current Vatican organizational framework, the secretary of state is responsible for ensuring that the pope’s policies and priorities take concrete form in the work of Vatican offices. The secretary typically has been very close to the pope and meets with him often. Many observers have suggested that the secretary’s role could change as part of a wider reform and reorganization of the curia. Because the office’s responsibilities are so broad — covering the internal workings of the Vatican, international church affairs and foreign relations — Cardinal Bertone was often blamed by critics when things went wrong during Pope Benedict XVI’s pontificate. When Pope Benedict appointed the cardinal secretary of state in 2006, it was a reunion of sorts. Then-archbishop Bertone had been secretary of the Congregation for the Doctrine of the Faith for seven years when its prefect was Cardinal Joseph Ratzinger. The appointment raised eyebrows because the secretary of state is usually a former member of the Vatican diplomatic corps. Cardinal Bertone had been a Salesian pastor, an archbishop and a Vatican official dealing with doctrinal matters. Yet, Cardinal Bertone did have experience as a sort of roving international troubleshooter: He flew to Havana in 2005 for talks with Cuban President Fidel Castro; in 2002, he was charged with trying to convince then-Archbishop Emmanuel Milingo to give up the idea of marriage and reconcile with the pope; and he met with a Fatima visionary, Carmelite Sister Lucia dos Santos, when he coordinated the publication of the third secret of Fatima in 2000, another delicate task. In a series of interviews before taking over the helm at the Secretariat of State, Cardinal Bertone made it clear he was not coming to the job with his own agenda. As he put it in one interview, the secretary of state should above all be “a man loyal to the pope,” someone who executes the pope’s projects and not his own. Archbishop Parolin was born Jan. 17, 1955, in Schiavon, Italy, and was ordained to the priesthood in 1980. He studied at the Vatican diplomatic academy while earning a degree in canon law from the Pontifical Gregorian University. In 1986, he began working at Vatican embassies, serving in Nigeria and in Mexico before moving to the offices of the Vatican Secretariat of State. He was named undersecretary for foreign relations in 2002.